If you happen to like this kind of post: my blog is packed with lots more stuff like this, all curated and maintained by me. Why not give it a look? Additionally you can subscribe to the RSS feed, follow bram.us on Twitter and even on Facebook 🙈. Right now I’m in Amsterdam attending CSS Day (my fourth time already!). Earlier this morning Bert Bos and Håkon Wium Lie – yes, the inventors of CSS – were on stage reflecting on the first days of CSS and things they’d’ve done differently or turned out differently than they expected. At the end of the talk the question came up if we, the audience, found if things were missing in CSS. Immediately aspect ratios came to my mind, as it’s something that has been bothering me for a few years by now, over, and over again (my first public musing about this dates back to 2012). Before going any further, let’s first take a look at the current hacks that exist to creating aspect ratios on the web. No. Just no. 1999 called. They want their IE5 back. A (hopefully) well known and longstanding hack to faking aspect ratios on the web is to abuse the vertical padding. By setting the height of an element to 0 and the padding-top or padding-bottom to a percentage based value one can force a box to have a fixed aspect ratio. The reason to why this hack works is that the padding of an element is calculated against the width of that element (*). The percentage is calculated with respect to the width of the generated box’s containing block, even for ‘padding-top‘ and ‘padding-bottom‘. If the containing block’s width depends on this element, then the resulting layout is undefined in CSS 2.1. — CSS2 Box Model: Padding properties: ‘padding-top‘, ‘padding-right‘, ‘padding-bottom‘, ‘padding-left‘, and ‘padding‘. Say you need a box with an aspect ratio of 16:9. The resulting percentage to apply as a vertical padding can then be calculated via the formula 100% * 9 / 16, resulting in 56.25%. Say you want a 4:3 box, use 75% instead (100% / 4 * 3). See the Pen CSS Aspect Ratios, Technique #1 by Bramus (@bramus) on CodePen. Works fine in all browsers – even good old IE2 will do – but one must admit: it’s a hack, right? See the Pen CSS Aspect Ratios, Technique #1b by Bramus (@bramus) on CodePen. See the Pen CSS Aspect Ratios, Technique #2 by Bramus (@bramus) on CodePen. Unlike the first technique, this technique doesn’t stretch out the .aspectratio element itself though. Only the generated content box is stretched out. This can make it quite nasty to style and rather impossible to center the contents both horizontally and vertically. A technique I’m very fond of is to use viewport based units to hack together aspect ratios. It’s really great when you’re implementing full-width layouts, independent of the size of viewport (most typical designs for, say, blogs eventually limit the width of the main column). See the Pen CSS Aspect Ratios, Technique #3 by Bramus (@bramus) on CodePen. On the upside you don’t need extra elements to wrap your content in, nor do you need to alter its position. On the downside however is the fact it isn’t very usable nor portable when things start shifting around or have different widths. Because this technique relies on explicit widths (eg. vw) instead of dynamic ones (eg. %), you’ll need to explicitly define the width/height per breakpoint and element. Huh? An element that has a width of 33vw will need to a height of 33vw / 16 * 9 = 18.5625vw to give it an aspect ratio of 16:9. An element with a width of 40vw will need a different height, even though they have the same aspect ratio. See the Pen CSS Aspect Ratios, Technique #4 by Bramus (@bramus) on CodePen. This technique inherits the upsides and downsides of technique 3, but also re-introduces the extra element required to wrap around the content. As already hinted in the title and introduction I find these techniques hacks and would like to see a proper, non-hacky, way to implementing aspect ratios on the web. Researching upon this topic it came to my attention that Tab Atkins started writing a proposal for this back in 2012, suggesting a likewise syntax. In it he highlighted a case where things would start to become fuzzy. What if you were to specify both the width, height, and aspect-ratio but with a wrong aspect-ratio for that width/height combination? For example, given an element with width:auto; height:auto; aspect-ratio: 2/1; max-height: 200px; in a 500px wide container, the element would first be set to 500px wide, then aspect-ratio would naively set the height to 250px, which is in violation of the max-height constraint. Instead, the element’s height becomes 200px and the width is set to 400px. If the element additionally had min-width: 450px, aspect-ratio would be completely ignored, as there’s no way to satisfy it. Since you can’t set the height to a fixed unit, no extra calculations would need to be done. Of course you’d run into problems when setting both the width and the height to aspect-ratio(…), but that can be specced out: only the last one defined will be used, the previous ones will revert to auto. On Twitter it was also pointed out to me that there’s a WICG repo on the issue. Greg Whitworth from Microsoft participates in the repo. The repo contains a link to a spec entitled Logical sizing properties which is also edited by Tab. So, can we use this “Logical Sizing” thing then? And when? Given the fact that Tab is present here at CSSDay I’ll be asking him about it later (I’m actually sitting next to him right now, yet he’s currently busy finishing up his slidedeck on Houdini – which he’s about to present later today – so I won’t be bothering him right now 😉). Speaking of Houdini: I’m not sure this can be fixed with Houdini but perhaps it could … another thing I’ll be asking Tab about. A follow-up post will definitely land, once I’ve picked Tab his brain on this. To stay in the loop on this I’d recommend one to subscribe to the bram.us RSS feed, or follow bram.us on on Twitter or Facebook. To me, it’d be better if it was implemented as a value of the height property. What if you wanted your min-height to be defined by an aspect-ratio? This’d solve that, too. Valid remark, which does indeed give a “+1” for the aspect-ratio()-function (or in your code ratio()-function) approach. I’ll take this into account in the follow-up post. Bram I’m curious what your opinion is on using JS to achieve aspect ratios? I know these are CSS based solutions – but as you’ve mentioned they are “hacks”. I was discussing this with a colleague and asked the question of what happens if Chrome for example makes a change that breaks this hack. Completely agree with you though; this is something that has been missing from CSS far too long. As it’s fixable by using CSS, I’d recommend to keep using the CSS hacks for this. No need to rely on JS for this. Calculating the padding with respect to the width doesn’t look like something that will change soon, so we can safely rely on it. I like the idea of easier way to specify the aspect ratio, and I like the suggestion by rory to make it property-independent. But I don’t think specifying the ratio in 16/9 would be a good idea. Instead, I would suggest two new units: An “h” (height) and a “w” (width) unit. 100w would be 100% of the width of the current element, whereas 100h would be 100% of its height. Nils, your suggestion of a unit that’s a percentage of the element’s width is interesting and more flexible than `aspect-ratio()`. Besides the `XXw` value for aspect-ratio, you could set an element’s margins to XXw. Having both directions, v and w, available to authors would result in circular references. Tab Atkins explains the problem for implementors in this post about Element Queries: http://www.xanthir.com/b4PR0. Another variation of your #2 example is to have the element be a flexbox row container, and have the generated content with `height`, `width` and all `flex` parameters set to `0`, but with the vertical padding as before. The element takes up **only** vertical space, causing the element to maintain a minimum height as per the rules of flexbox while not interfering with any other child content. Moreover, if other content is higher than the aspect given, the box can also expand vertically. Also you can align child content any way you need to. It seems that this approach isn’t working. The container’s height stays same all the time. Unlike the first technique, this technique doesn’t stretch out the .aspectratio element itself though. Only the generated content box is stretched out. In the case where someone uses two both aspect-width and aspect-height, whichever comes last will win out, i.e., cascade. aspect-width would also overrule width if it comes after in order, as well, aspect-height would overrule height. Just depends on order. I think its an interesting trick to use `padding-top` as a percentage. NOTE: Chrome and Safari (and other Webkit based browsers) interpret this css trick differently from other browsers. They calculate the padding-top based on the PARENT or containing element’s width, where as Firefox and Edge calculate padding-top based off the SUBJECT elements width. A big difference that had me struggling to figure out what was going on. So that requires some conditional media queries to style differently based on which browser is rending the CSS. Not the best solution but it works. 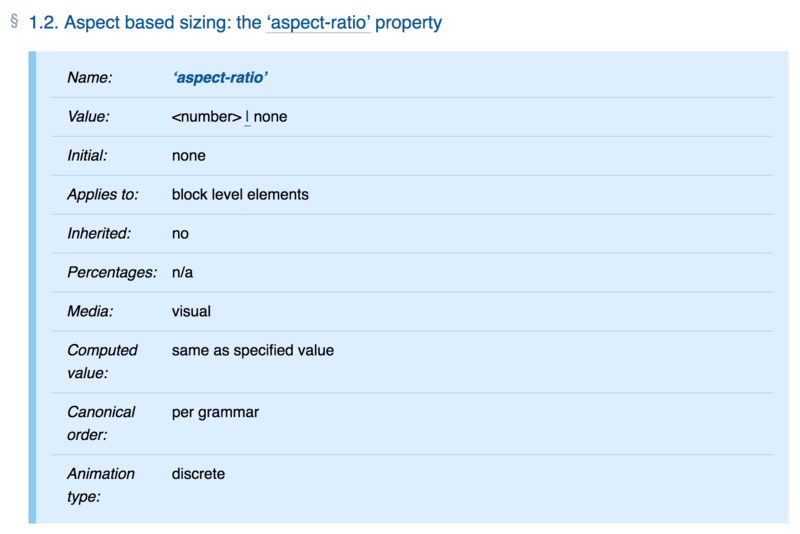 I’d love to see a real spec for making aspect ratios is css, where all browsers implement it the same way. I hope this helps someone.